Dark, mysterious, and dripping with ominous potential, the Shadow Plane is a favorite of spellcasters and arcane experimenters. Both coterminous and coexistent with the Material Plane, this strange realm provides creatures for summons, energy for spells, and a risky shortcut for canny travelers. 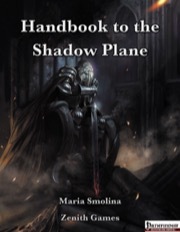 In this tome you will find some secrets of the Shadow Plane unmasked. 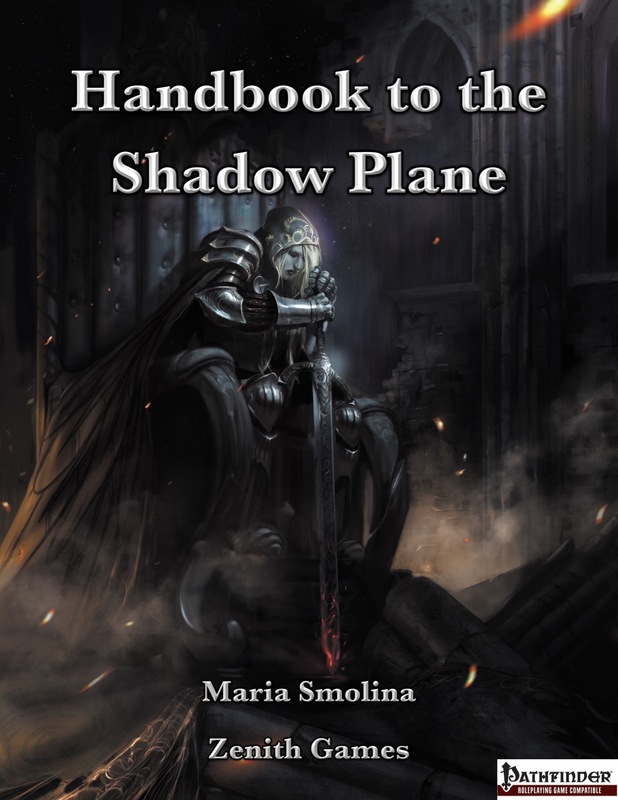 The Handbook to the Shadow Plane provides new denizens, hooks, and qualities for the Plane of Shadow, including new rules on traveling between layers of shadow, plane-specific encounters, and treasures you might plunder from this mysterious world. Inside the Handbook to the Shadow Plane, you will find. Umbral paths, umbral portals, and the hazards therein. The maddening curse of the baleful moon. Memory stealing dusk snatchers and umbral hags. Shadow imbuements, umbral elixirs, and umbral compasses. Spells such as darken the inner light and shadow puzzle sphere. The shadow shaman spirit and the class-transforming shadow psychopomp hex. Don't go traveling without it! I love using Shadow Plane travels for my players, it adds a lot of mystery and extra dimensions for the game. Following a path leading deep into the the forest's past centuries, to get blocked midway by a hut of an umbral hag? Such things happen when GM uses this book! @Laik Yep, I made an umbral path between a sleepy(esque), shadowy gnomish village (dusk snatchers) below a ruined tower leading to a twisted reflection of that same area when the tower stood a couple centuries before (and inhabited by the village's current lord). It used a shadow roper and a large area of the twisted shadows hazard from this handbook for its guardian (and some scattered stone monoliths to camouflage the roper until it revealed itself). It made for a nice tactical combat. It's about 16 pages (18 with table-of-contents and intro) with most of its attention on the shadow monsters, hazards, and fleshing out the shadow shaman features. It doesn't spend a lot of time rehashing the Shadow Plane's planar traits (which are easy to find and well-known), but sticks with the differences between the Deep and Border Shadow and methods of navigating between them and the Material Plane. The hazards are interesting and easy to place anywhere really, even shadowy areas of the Material Plane (the baleful moon being a possible exception, since I'd want to make sure I was ready for my players to encounter it).